You’re going to want waffles in 12 hours, right? I ate a Liege Waffle from a food truck at a festival a few weeks ago. Oh my gosh! Rich, and sweet, with little nuggets of pearled sugar. I only had enough tickets to get a plain one (By the way, I hate the tickets at a festival thing- you have to stand in line for tickets, then stand in line for food, then you have either too many, or not enough.) But even the plain one was delicious. It made me want to research the whole Belgian Yeast-raised waffle deal. I went to Smitten Kitchen and the scary thing was just how much fat these things have. I’m not against fat, if you can take it, but we’ve got some health issues around here. Pancreas don’t care if it’s butter, or coconut oil, or crude oil, too much is too much. These recipes call for (full stick?) of butter. Ummmm…that winds up being more than Kate’s allotment for the whole day in one waffle. Now, I have played with fat reduction and replacements in baked goods- apple sauce makes waffles a bit too sticky, so I decided to try pumpkin. And as long as the waffles are orange…why not add pumpkin pie spice? The pumpkin adds moisture and replaces some of the fat- notice that these are low fat, not non. You could use egg whites, and no butter at all. We tried one batch that way with apple sauce, and they were disappointing. I mean, we still ate them, but if you are standing over a waffle iron, you want something worth your time. The ingredient that has me stumped in these recipes is the pearled sugar- it was in the festival waffles from the waffle truck, but it is not a pantry staple for me. Maybe it should be… anyone know where to get it? So, the set up the night before, is to make a sour dough, essentially. I have done sourdough before, with a jar on the counter, then in the fridge, then you periodically make a loaf of bread…I have gotten off the sourdough treadmill, honestly. My kids don’t like sourdough bread much, and I don’t like it enough to have a loaf every week. But a facebook comment from a friend who makes sourdough waffles made me think about getting back on the treadmill- I wouldn’t have to make bread every week, I could do waffles, or pancakes… that’s another blog post. Bloom the yeast in the warm water, stir in the milk, butter and the flour. Let rise overnight (or during the day- brinner, am I right?) 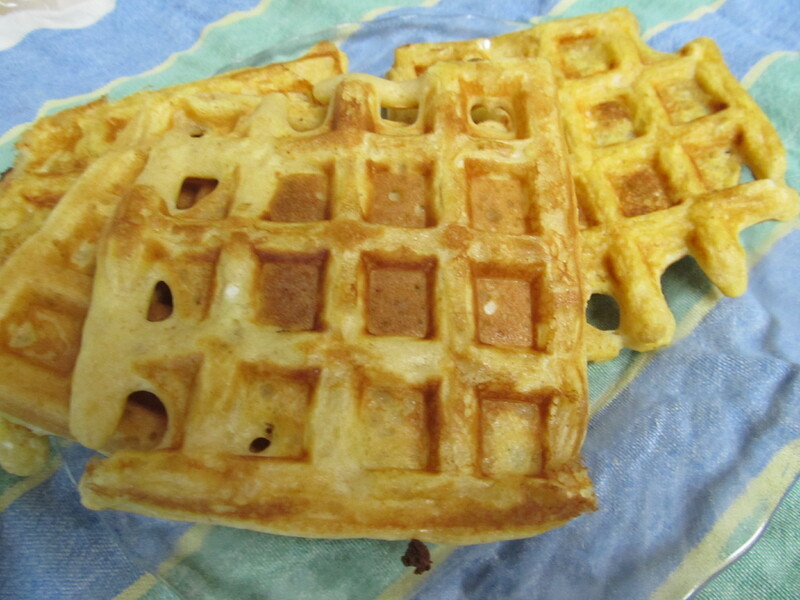 When ready to make waffles, beat an egg, add the baking powder, egg and pumpkin to the flour, yeast and milk mixture. The batter will be pretty runny. Cook according to your waffle iron directions. I love these topped with peanut butter and apricot preserves, the kids eat with syrup, obviously. Edited to add: scouts report (no, really, actual scouts, like they have uniforms and everything) that the Ikea south of Denver (is it technically the town of Superior?) does not have pearled sugar. Any ideas? Previous The Blizzard Bag Next So, when am I going to get homegrown vanilla? I just want to start by saying I love your website. Keep up the good work. I got up a little early this morning to make breakfast for my girlfriend while she was still fast asleep. I added a little more pumpkin by accident. But they were still delicious. Thank you very much for the recipe.